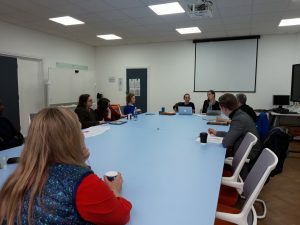 On the 6th of February the ISRU met to discuss the Work-In-Progress paper entitled ‘Conceptualising the establishment of intergovernmental organisations: Learning from the IPCC and IPBES’. This paper was co-authored by Dr Hannah Hughes and Dr Alice Vadrot. Dr Hannah Hughes is a lecturer in International Relations and Co-director of the Environmental Justice Research Unit at Cardiff University. Dr Vadrot is an Assistant Professor in the department of Political Science at the University of Vienna and holds a Starting Grant from the European Research Council for her research project “The Politics of Marine Biodiversity Data: Global and National Policies and Practices of Monitoring the Oceans (MARIPOLDATA)”. The two have a long-standing collaborative relationship having first started working together in September 2015. Among other publications, they have a forthcoming article titled ‘Weighting the world: IPBES and the struggle over biocultural diversity`, which will be published as part of a special section in Global Environmental Politics. Dr Hughes completed her PhD on the IPCC (Intergovernmental Panel on Climate Change) and Dr Vadrot did ethnographic research on the IPBES (Intergovernmental Platform on Biodiversity). Unlike much prior scholarship on these bodies, both Dr Vadrot and Hughes’ research on the IPCC and the IPBES is deeply empirical, with both researchers having spent time observing these bodies and their functioning. Through this empirical research, both were convinced that they were better able to grasp and analyse the power struggles within these bodies, the agency of the key figures and their evolutionary trajectories as intergovernmental bodies. Therefore, the pair considered a comparative approach appropriate to these two environmentally concerned intergovernmental bodies, despite the fundamental differences between the issues Biodiversity and Climate Change. In the paper, the authors argue that despite the differences in the organisations and their issue areas, there are many similarities in the evolution of both the IPCC and the IPBES including some of the key actors. Equally, both bodies have experienced similar crisis such as contestation and power struggles between actors of the Global North and Global South and trying to maintain stakeholder investment and financial contributions. However, the authors also highlight the way in which there have been clear attempts to learn the lessons of the creation of the IPCC in so that the IPBES can circumnavigate some of the obstacles the IPCC had to overcome. Following the ISRU Work-In-Progress seminar I spoke to Dr Hannah Hughes and Dr Alice Vadrot about this particular paper, about their research projects together and about the current questions surrounding the future of both the IPCC and IPBES in global politics. The research was clearly driven by your empirical observations of both bodies. For example, Alice you mentioned having conducted ethnographic research at several plenary sessions of the IPBES . What is it exactly that you believe to be so revelant about these kind of methods to facilitating our understanding of the functioning of these bodies? During IPBES plenary sessions, governments adopt – line-by-line- Summaries for Policy Makers (SPM) of assessments produced by a diverse range of experts. Observing the negotiations and interventions by different government representatives enables us to understand the field of forces within which global environmental knowledge is authorized and contested. Capturing these moments of contestation, such as in the case of the concept of “ecosystem services” or “bicultural diversity”, which we describe in our first co-authored paper, provide as with rich descriptions of the strategies and forms of capital that governments use to maintain or contest global (knowledge) orders. Who makes what intervention, how and with what effect? Answers to these questions require taking part in the negotiations and systematically observing these sites. We have both also taken part in negotiations at CBD and UNFCCC COPs, which is why we argue that IPCC and IPBES need to be studied in line with multilateral environmental agreement making and not as separate processes or isolated practices, as some of the literature suggests. Much of what we see at IPCC and IPBES plenaries, including the composition of delegations, individual actors, and the bargaining between them is almost identical to what we see in CBD or UNFCCC. One thing that struck me about the paper was the mobilisation of Bourdieu’s conceptual tools of field, interest and symbolic power. What is about these tools that you find so pertinent to understanding the functioning and the evolution of the IPCC and IPBES? Was your use of these concepts associated with the IPCC and IPBES’ status as knowledge providers or are they concepts that could be mobilised in research on any form of intergovernmental body? It’s their practicality – the way that they help you organise your study of a particular problem and help you see it in a completely different light than is often accounted for in the literature. I also love how this approach enables you to re-construct this understanding for others – using all forms of data to highlight and evidence how power is distributed and with what effects. In that respect, they can really be used for any research problem, but they are good for the intergovernmental knowledge setting because these are particularly complex sites, where you have multiple types of actors and forms of capital shaping the outcome. Do you believe there has been some element of lessons learned from the IPCC that lead to specific changes in the establishment of the IPBES? For example, such as the greater focus on Indigenous and Local Knowledge (ILK)? Underpinning this argument with empirical evidence is very difficult. There are several aspects that indeed seem to suggest that IPBES learned from IPCC: First, IPCC experienced experts, chairs and national delegates took part in IPBES negotiations and it is indeed very likely that they knew about IPCC weaknesses and tried to avoid them in the establishment of a new body. Second, deliberations among scientists and the international biodiversity community predating the IPBES establishment explicitly refer to IPCC. Its design and assessment practice – allowing text produced by experts to be adopted by governments – was seen by many as a way through which scientific evidence could enter the policy sphere and strengthen the knowledge base of CBD and other biodiversity related conventions, potentially increasing the success of their implementation. At the same time, the limitations of the IPCC as role model were always at the center of the debate, not necessarily because of the lack of ILK in IPCC, but because it was felt that biodiversity policy and knowledge requires a different institutional design, which reflects the local, place-based character of biodiversity and ecosystem services. Particularly the EU was opting for regional assessment hubs instead of one single global body. This partly related to more general concerns regarding the way in which IPCC has shaped what constitutes authoritative knowledge on climate change. This includes the lack of social science perspectives and the dominance of scientists from the global north. Once the decision to establish a single global body was taken –this was in 2010- and in order to be conceived as legitimate assessment body by all governments and particularly to convince the rather skeptical governments from some Latin American states, IPBES had to opt for rules and procedures that increase disciplinary and regional balance among its assessment authors. This included going beyond the function of assessment production and allowing capacity building to become an important pillar of IPBES. The recognition of ILK and the establishment of an ILK taskforce was rather something that resulted from struggles related to the initially rather narrow framework of IPBES and its focus on ecosystem services. The contestation of the ecosystem services framework put forward by individual governments such as Bolivia and the quest for alternative approaches and diverse knowledge forms lead to the formal recognition of ILK. It was because some governments fought for it and of course, because governments of the global south had – compared to 1988, when IPCC was established – learned how to shape the outcome of negotiations. The IPBES seems to be experiencing difficult times with the notion of biodiversity itself becoming increasingly contentious, do you think the IPBES’ status as a central knowledge provider is at risk? Or this just part of the establishment process? From observations, I did at COP 14 of the CBD, IPBES and its products seem to have become an integral part of international biodiversity politics. IPBES successfully adopted thematic, methodological and regional assessments and will very soon adopt its global assessment, which will certainly be some kind of a testing ground for the young organisation. Can IPBES repeat the success of the Millennium Ecosystem Assessment? Will the report have the same public echo than the IPCC reports did? Will it be recognized by governments and the scientific communities? The adoption of the global assessment in Paris this spring will certainly tell us a lot about the direction the IPBES is heading. More generally and on top of your question, we could also ask if the struggles that we observe anticipate new knowledge orders or if they manifest an incremental loss of authority of (northern) science more generally. Where do you see this research going from here? Do you think that you will continue to work together on this kind of comparative approach? We will definitely continue to work together. One of the things that we are most interested in now is helping the next generation of masters and PhD students to develop these kind of analytical and methodological skills. We both consider this absolutely essential for challenging how we understand global biodiversity and climate politics. These issues are only getting more serious, we need to build knowledge that challenges the present political order and environmentally destructive practices rather than reproducing them. Rosa:Thank you for taking the time to present your research at the ISRU WIP seminar and sit down and talk to me!